Lance Moss made a career-first visit to the www.rockauto.com USCS victory in the USCS vs. URC “Spring Speed Xplosion” on SaturdLance Moss made a career-first visit to the www.rockauto.com USCS victory in the USCS vs. URC “Spring Speed Xplosion” on Saturday night at Lancaster Speedway. ( Frank Simek photo).ay night at Lancaster Speedway. ( Frank Simek photo). Lancaster, SC — (April 11, 2014) — Lance Moss from Cherryville, North Carolina raced to a career-first sprint car feature win in the USCS presented by K&N Filters vs. Rislone URC North vs. South “Spring Speed Xplosion” Round #2 at Lancaster Speedway on Saturday night. Moss then had an emotional victory lane celebration thanking all involved in making his win possible. Moss also reversed the previous night’s finishing order by besting his cousin, Johnny Bridges also from Cherryville, North Carolina for the top spot. 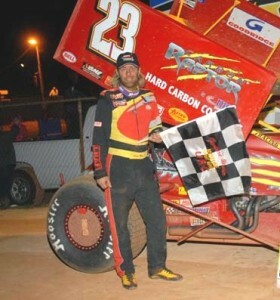 Bridges, who followed Moss to the www.rockauto.com USCS Victory Lane in the runner-up spot made a late race pass of Moss on Friday night at Carolina Speedway to spoil Moss’ victory plans in Round #1 of the two night battle. The 2012 Rislone URC Sprints Champion, Robbie Stillwaggon from Burlington, New Jersey finished in the K&N Filters Podium award third place, Stillwaggon was followed by URC regular Troy Betts from Newark, Delaware in fourth place. Betts far and away bested his sixteenth place finish on Friday night when he flipped while running in second place. Female hot-shoe Morgan Turpen from Cordova, Tennessee completed the top five finishing drivers. The 10-time USCS National Champion, Terry Gray from Bartlett, Tennessee headed the next group in sixth place. Young gun Eric Riggins, Jr. from Charlotte, North Carolina intended to leave his mark on the weekend’s competition. Riggins grabbed the lead from Moss who started from the K&N Filters Pole Position on lap seven and led until lap eighteen when his car jumped out of gear. He pushed off and restarted from the rear to recover to seventh place at the finish. Thr mechanical failure was most likely cause by damage from his “out of the park” experience at Carolina Speedway on Friday night when he flipped completely out of the speedway while battling Lance Moss for the lead. Terry Witherspoon from Jacksonville, Florida finished in eighth place followed by Brandon McLain from Indian Trail, North Carolina in ninth position and rookie Brad Franks from Collegeville, Pennsylvania rounded out the top ten. Terry Witherspoon kicked of the evening’s action by winning the 6 cars, 6 laps Hoosier Speed Dash. USCS regular Morgan Turpen won the Engler Machine and Tool First Heat. Troy Betts won the Butlerbuilt Second Heat. After first heat winner Morgan Turpen drew a six in the K&N Filters Pole Award drawing, sixth postion passing points earner, Lance Moss garnered the K&N Filters Pole Position. Tim Perry advanced the most positions in the A-Main to earn the Wilwood Disc Brakes Hardcharger Award. The next event for the USCS Outlaw Thunder Tour winged sprint cars will be a paved track contest on Friday, April 25th at Anderson Motor Speedway in Anderson, South Carolina a 3/8 mile paved oval. The following night the series will make its third-ever visit to the paved 4/10 mile Southern National Motorsports Park in Kenly, North Carolina. For rules, schedules and other info on the USCS Outlaw Thunder Tour winged sprint car series 2014 and 18th annual tour please visit www.uscsracing.com or call 770-460-7223 or 865-6097. Hoosier Speed Dash winner: Terry Witherspoon, Morgan Turpen, Terry Gray, Lance Moss, Robbie Stillwaggon and Johnny Bridges. Engler Machine and Tool First Heat: Morgan Turpen, Robbie Stillwaggon, Terry Gray, Lance Moss, Brandon McLain, Joe Larkin, Tim Perry and Bob Auld –DNS. Butlerbuilt Second Heat: Troy Betts, Eric Riggins, Jr., Johnny Bridges, Terry Witherspoon, Brad Franks, Jay Dunham, Jason Troutman and Bill Moore. Pyrotect racing Cells Lucky Seven Award: #47 Eric Riggins, Jr. The United Sprint Car Series presented by K&N Filters would like to gratefully thank its sponsoring partners for their involvement in the 2014 and 18th anniversary USCS Outlaw Thunder Tour: K&N Filters, www.rockauto.com, Engler Machine and Tool, Butlerbuilt, Wilwood Disc Brakes, Saldana Racing Products, Pyrotect Racing Cells, DMI/Bulldog Rear Ends. KSE Racing Products, Schoenfeld Headers, DSR Fuel Systems, Brown and Miller Racing Solutions and Safety-Kleen.